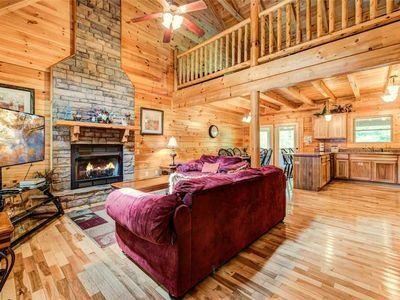 Although Hidden Pleasures is tucked away in a quiet, lushly wooded area of Pigeon Forge, its pleasures are apparent as soon as you arrive at the 4-bedroom log home. For starters, the surroundings are blissfully serene. 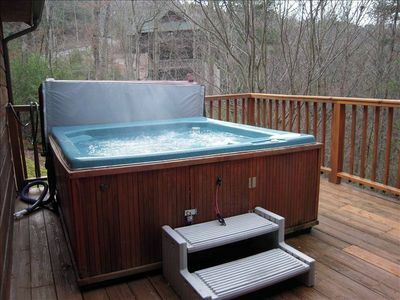 You can enjoy them from one of the front porch’s chairs, while gathering around the rear deck’s coffee table for appetizers and drinks, or best of all, as you luxuriate among the massaging waters of the deck’s 5-person hot tub. More delights can be found inside Hidden Pleasures. The main floor’s great room, for instance, is airy, bright, and welcoming. The wood-planked walls, floor, and cathedral ceiling gain extra luster when a fire glows within the stone-surround fireplace. 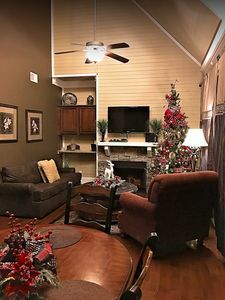 When you’re not watching a movie on the flat-screen TV with satellite channels, you can play a game with the kids at the coffee table or even stretch out for a nap beneath the gentle whirr of the ceiling fan. The dining area can seat up to 12 people: 8 at the table and another 4 at the breakfast bar, which can pull double duty as additional kitchen counter space. Speaking of the kitchen, it’s fully equipped with appliances ranging from a refrigerator/freezer to a blender, along with plenty of pots, pans, and tableware. There’s even a dishwasher, leaving you more time to play pool or foosball. That’s right: Hidden Pleasures has a full-size pool table in the loft’s game room and a foosball table in the downstairs game room. Other entertainment options in the lower game room include a dartboard and a large flat-screen TV with a DVD player and surround sound. The upstairs game room, meanwhile, has its own TV plus a pub-style table ideal for playing cards or board games. Also in the loft is one of Hidden Pleasures’ 4 bedrooms. 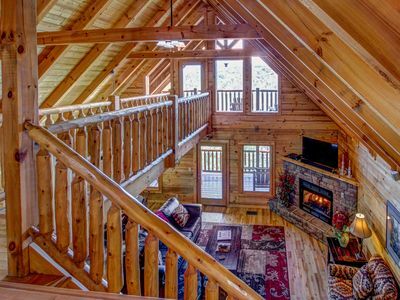 This one is a full-on suite, with its own jetted tub, a private bathroom, and a queen-size bed, along with glorious views of the treetops and a cathedral ceiling that gives the space a sense of luxury and grandeur. The master suite, on the main floor, has its own private bathroom with a jetted tub. 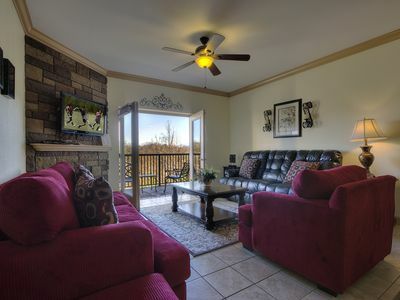 In addition it boasts a king-size bed, as well as a door that opens directly onto the deck. You can slip outside first thing in the morning to savor the sunrise and serenity without waking any of the others. The remaining 2 bedrooms are downstairs. One includes a queen-size bed; the other has a pair of double beds, so that 4 people can sleep there. These bedrooms share the 3rd bathroom, which is so spacious, it contains a washer and dryer; in addition, there’s a half-bath on the main floor. All 4 bedrooms, by the way, have their own TV. 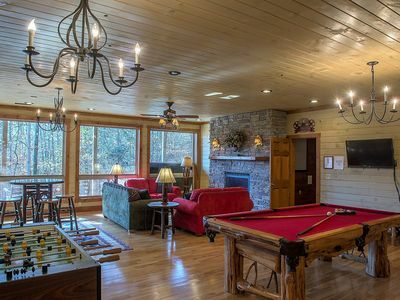 And sofas in the upstairs and downstairs game rooms, as well as one in the great room, convert to queen-size beds, enabling Hidden Pleasures to accommodate 16 overnight guests in all. And that’s not counting pets; yes, pets are welcome here! Hidden Pleasures’ semi-secluded location is part of its restful, restorative appeal. 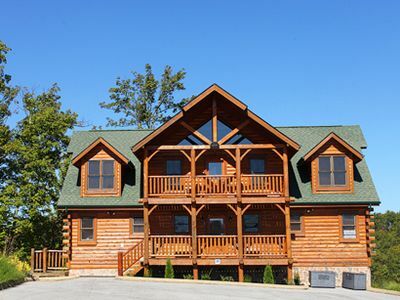 At the same time, the cabin is surprisingly close to the major attractions of both Pigeon Forge and Gatlinburg. 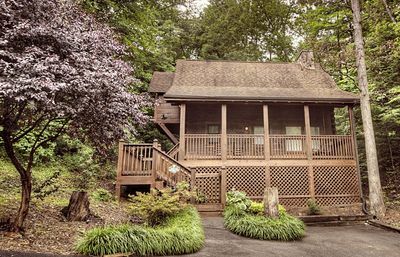 Within 10 minutes you can drive to Gatlinburg Golf Course or the Great Smoky Arts & Crafts Community, an 8-mile trail of more than 120 galleries, studios, and shops. 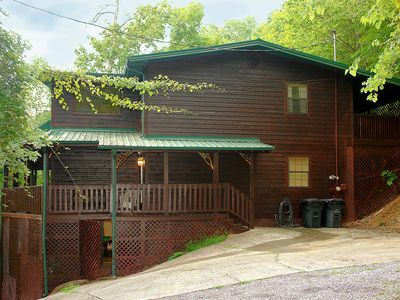 Dollywood is only 15 minutes away. 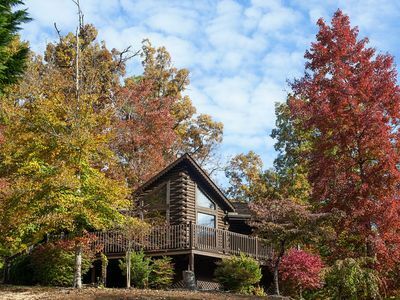 And just a few minutes farther are the Titanic Museum, the Great Smoky Mountains National Park, Ober Gatlinburg Amusement Park and Ski Area, and downtown Gatlinburg, home to the Guinness World Records Adventure, Ripley’s Aquarium of the Smokies, thrill rides, mini golf, and more. Action-packed days and laid-back nights… or vice versa. 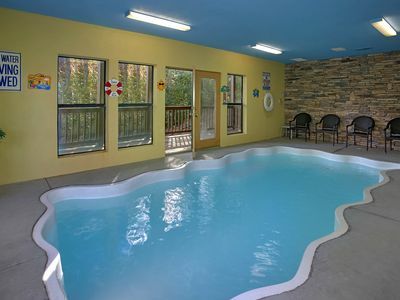 When you stay at Hidden Pleasures, the choice is yours. First, though, you need to make your reservation. Do so today, before someone else gets here first! 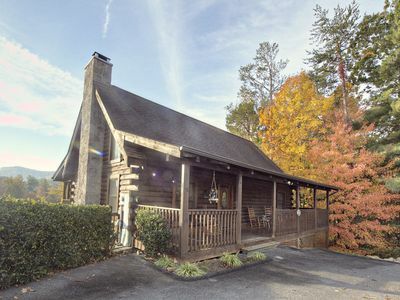 Unique retreat for the entire family to enjoy with antique theater seating and great views. 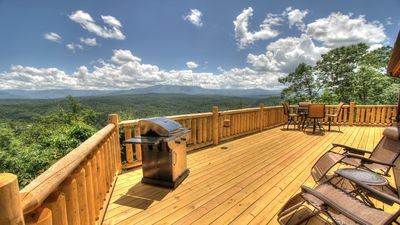 APRIL 22-24 OPEN!/VERY PRIVATE!/BREATHTAKING VIEWS!/LOFT THEATER!/FIREPIT! 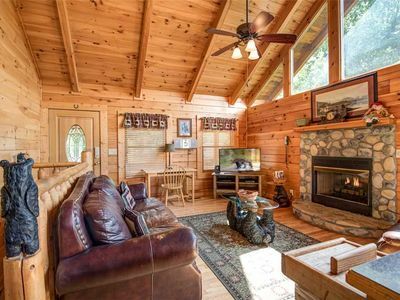 Beautiful cabin on Douglas Lake at gateway of Great Smokey Mountains! ER6 - On Eagles' Wings - Great location...close to all the action! ER206 - Mountain Rendezvous | Great location - Close to town!